Sorry to get this up so late guys, but I’ve been home with the flu since Thursday afternoon and haven’t been able to do much of anything until now. Well, where do I start? I gave this issue a higher grade than last issue, for the simple reason that the story here seems to hold together a little better and because of the well-written action scenes. The dialogues weren’t as cringe-worthy as last time either (which came as a surprise to me then, given that dialogue is one of Diggle’s strong suits). However, the fact that I simply don’t like where this story is going is inescapable and must necessarily affect my grade. If this had been about any other character, if the villain had been someone else and this was just a “street-level Avengers” event, the story would be much more palatable to me. But, this is Daredevil we’re talking about. And this isn’t just me being a cranky fan-girl either. I was onboard for the first half of this event (and the Daredevil title, quite amazingly, manages to still be good in spite of itself), and I could imagine how a “Daredevil takes a trip to the dark side” kind of story might have been written. By actually centering the story on the always compelling theme of the difference between good and evil – and how difficult it is to decide in a world where nothing is black and white – this could have been so much more rewarding. I’m talking about a situation where the “evil” side of the equation doesn’t see his own evil, and genuinely feels that he is doing good. The Beast in this story doesn’t only remove the good/evil ambiguity that would have been so interesting, but it also introduces much more of the supernatural into Daredevil’s corner of the Marvel Universe than I’m used to seeing. This may not bother some of you, but I’ve always appreciated the down-to-Earth and not-your-typical superhero aspects to Daredevil. It’s not as if he hasn’t encountered his fair share of magic in the past, but it’s not particularly common and for the last decade, Matt Murdock has been firmly entrenched in a reality next door to ours. Of course, this is ultimately a matter of preference, but for me, these elements bring the event down another notch. I also wish we could have seen a different artist on this event. Billy Tan is absolutely fine, really, especially in this action-heave issue, but using an artist who’s more in the hyperrealistic vein might have helped sell the more fantastical parts of the story better. As for what actually happens in this issue (spoilers ahead if you haven’t read it), we see Elektra turn on Daredevil and bring the rest of the heroes into Shadowland to finish him off, preferably before he manages to resurrect Bullseye (from the looks of things here, they don’t actually get that far). Their attempts to kill him seem to be in vain, however, and on the last page we see Daredevil more or less transform into something else. We also see the Kingpin and Lady Bullseye plotting to take advantage of the riots on the streets to do… something. Exactly what should be apparent in the next issue. Well, most signs point to Daredevil dying in the next issue. This should have me heartbroken. But, if it leads to a better story in Daredevil: Reborn and he eventually gets his own book back – or a new one – I’m certainly onboard with that. We all know Diggle can write, I just wish we’d gotten to see him write a very different story than what this is shaping up to be. The difference in tone between Shadowland and Daredevil continues to be quite striking and, judging from past interviews (like this one), this appears to be deliberate, with the Daredevil title more tailored to Daredevil readers. I’m having a hard time wrapping me brain around this. Maybe I should leave that for a later post. I concur. I desperately wanted to like this, but I just didn’t. I feel that the whole Beast thing is nothing more than a cop-out. Again, Marvel simply takes the easy way out, instead of truly exploring another facet of a character. It’s a shame, and a missed opportunity. But, hey, if it sells, who cares, right? Sometimes I get really fed up with comics from the Big 2. It took me a whole 3 minutes to read this. Happily put it back on the shelf and saved my money. Absolute worst Daredevil story since the pre – Guardian Devil 90s. Yes I’m including that ridiculous arc where Matt and Foggy take the case where they sue Daredevil. The fact that Spidey, Cage, and Rand had to be told that Matt was possessed made them all look retarded. Yeah Matt has done some crazy and extreme things in the past but really? Becoming the leader of the Hand (who you know have a habit of brain-washing) and builds a fortress in the middle of town and starts killing and imprisoning cops. The Beast just believed Elektra had joined him out of the blue and was then surprised she betrayed him? The fact that Spidey, Cage, and Rand all were so willing to kill Matt, cause you know its not like anybody in the “hero biz” has ever been possessed by a bad guy. You’d think Spidey and Cage would be like “Hey old man this is all kinda your damn fault!” to Izo. Personally when Matt Murdock “reborns” or whatever garbage gimmick happens I’d like to see him tell all his “friends” to f*** off since this terrible story is now canon. I was almost ready to say it was out of character for Wolverine too. Then I remembered that Logan is no longer the honorable warrior fighting back his demons. He’s just killer and an a**hole. Wolverine now is basically what Sabertooth was in the 90s. Maybe Marvel is deliberately making this story terrible so readers will actually be happy when Black Panther takes over the main title. I can’t see how any new reader would read Shadowland and then ever want to read another Daredevil story. That’s exactly what I think about the whole event. It’s infuriating loyal Daredevil readers and attracting potential new Daredevil readers by including big names like Spider-Man, Wolverine, Punisher, etc. just so they can read one of the worst Daredevil stories in decades. Great idea, Marvel. You really know how to please the fans. I maintain that this story arc was not pitched by Diggle/Johnston as an event, rather it was made into event by Marvel editors. It’s evident by the absurdity and lack of logic present in the story. Had this just been a story arc in the Daredevil title, it would have had less weight to it because Matt Murdock wouldn’t end up dead as a result. I’m confident in saying that the kind of story that would have been told would have been more in line with what Christine suggests above and infinitely more plausible and enjoyable. Instead, we’re getting ripped off and angry about the slap in the face story we’re reading instead. 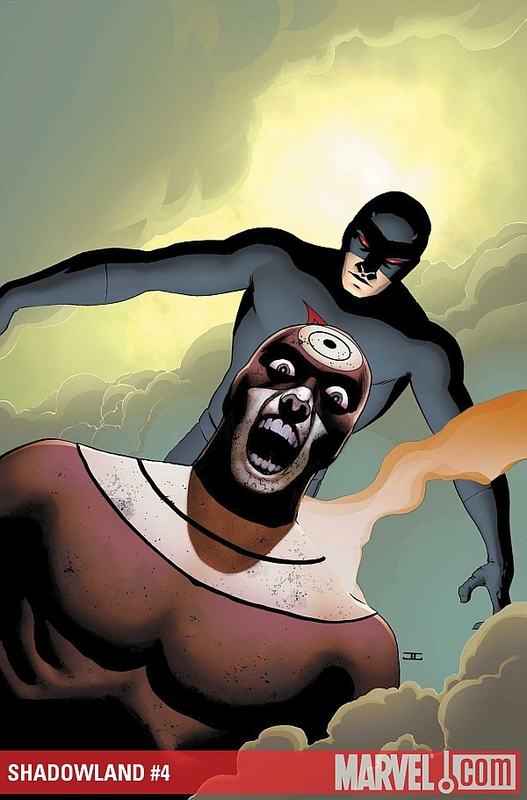 It’s a travesty and a great injustice to Matt Murdock/Daredevil/The Man Without Fear. At least they *tried* to kill him. It would not be atypical of superheroes to only use non-lethal force against their friend. The heroes’ ability to see killing as their only option is a rather interesting development when you think about it. Did Spider-Man okay this plan? Did Luke and Danny? I wish I had seen that discussion since that would be a good story. Unfortunately, we skip that and prepare for the fight scene! Where *are* the Avengers from SHADOWLAND #1? Remember when they said they would be watching this situation closely? What has happened to convince them Iron Fist and Luke Cage have this under control? Huge explosions in the heart of NYC? People dying all over the place? Massive rioting on a scale unseen (in NYC) since the draft was instituted during the American Civil War? J. Jonah Jameson should have called in the National Guard days ago to quiet the riot, if nothing else. Even Jameson would have reached out to the Fantastic Four and Avengers by now — and he *hates* superheroes. Speaking of rioting, why are these people being allowed to run amok anyway? Aren’t the Hand under strict orders to maintain martial law in the Hell’s Kitchen area? People are setting cars on fire outside Shadowland! They should have throwing stars in their jugulars about now. I suppose that order has been rescinded, but I don’t exactly see why. Maybe I should just chalk this one up to the influence of the Beast and a newfound apathy for the common folk. Removing the Hand to Shadowland and preparing for a siege is a ridiculously silly idea for Matt/Beast though. Assuming they have ample supplies, they can’t be operating under the misguided belief that they’re safe unless they’re all idiots. Punisher blew a hole in the wall with a mere rocket launcher. And he’s unpowered! You’re fighting superheroes! Luke Cage can punch through walls, I imagine. Iron Fist definitely can. No Hand ninja has yet defeated a single superhero. Why would you be better trapping yourself in a building with an entourage of incompetent guards? Typhoid Mary is not *that* powerful. Elektra is badass, but not really in the same weight class as Luke Cage. Lastly, it bothered me that Wolverine and Elektra acted like they had no knowledge of each other’s histories. They fought each other during the “Enemy of the State” arc in WOLVERINE when Wolverine was mind-controlled *by the Hand* and became their assassin. And then Elektra was mind-controlled (but only kind of) and became the leader of the Hand until she and Wolverine took down, well, about a thousand ninjas. Maybe they were just cracking little jokes, but their facial expressions indicated they were simply conveying information. It just seemed a bit like sloppy writing in the name of exposition. Exactly what I thought this event was supposed to be about. That’s what I dislike the most about this mini, the potential wasted. Had they focused on that thematic goal instead, this story would’ve been terrific. I liked Elektra’s comments when she was trying to reach Matt near issue’s end. Nice acknowledgement of history, but her previous dialogue was rubbish. She completely side-stepped Punisher’s question about why he couldn’t simply shoot Matt. I’m a bit behind in my reading, but this is a giant, disrespectful mess.